Capt. 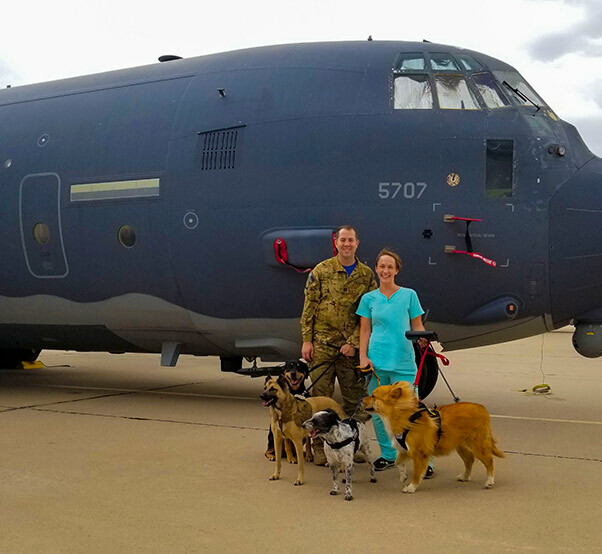 Daniel Hale, 563rd Rescue Group officer in charge of plans and scheduling, and his wife Dr. Kristen Hale, veterinarian, pose in front of an HC-130J Combat King II with their rescue pets at Davis-Monthan Air Force Base, Ariz., Sept. 8, 2017. The Hales fostered roughly 20 sheltered animals from 2015 to 2018 in order to help them find new homes. 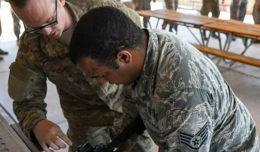 To ensure these animals receive the support they need, U.S. Air Force Capt. 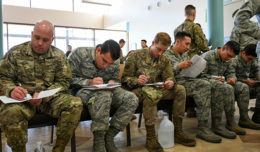 Daniel Hale, 563rd Operations Support Squadron officer in charge of plans and scheduling, and his wife Dr. Kristen Hale, veterinarian, decided to take on the responsibilities that comes with fostering rescue animals. The Hales began their animal rescue efforts with their dog Squish. After adopting Squish into their family, the Hales continued to foster companion animals. In the past three years, the couple has fostered over 20 sheltered pets. 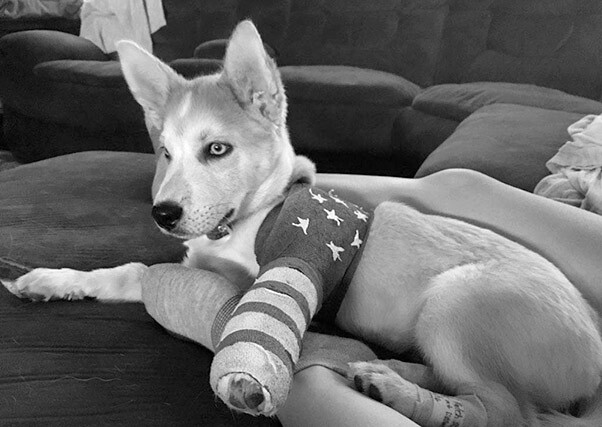 Benny, a dog being fostered by the Hale family, rests on a couch in Vail, Ariz., May 6, 2017. Benny was fostered by the Hale family for three months before he was fully healed and adopted by a new family. Unfortunately, not all fostered pets in the care of the Hales are immediately adopted by families due to the medical condition of the animals. Thanks to the help of local rescue shelters, foster families don’t have to worry about paying for the medical expenses of the animals while the rescue pet is in the family’s care. Because of the nature of some of these medical conditions, the time it takes to nurse the animals to full health can vary. Dr. Kristen Hale, veterinarian, plays with two puppies in Tucson, Ariz., Nov. 10, 2016. 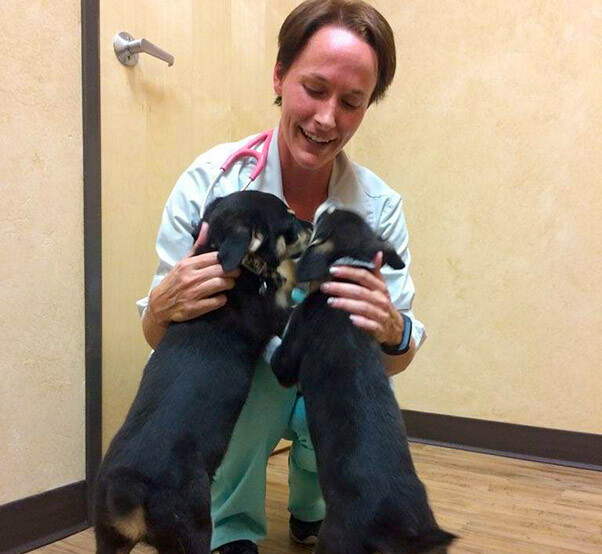 Dr. Hale fosters sheltered animals in order to help them find new homes with the help of her husband, U.S. Air Force Capt. Daniel Hale, 563rd Rescue Group officer in charge of plans and scheduling. Because of the efforts of families like the Hales, shelter adoption rates have steadily climbed over the years leading to fewer overcrowded facilities. According to the American Society for the Prevention of Cruelty to Animals, adoption rates have risen roughly 18 percent from 2011 to 2017 and shelter animal euthanasia rates have decreased approximately 42 percent. “If you can’t keep an animal around for long or are not ready to make the commitment to permanently care for a pet, you can still make a difference by providing them with a foster home,” Dr. Hale said. To find out more information on fostering and adopting companion animals, visit your local animal shelters. Cinder, a cat fostered by the Hale family, walks in a handmade wheelchair in Vail, Ariz., June 4, 2018. 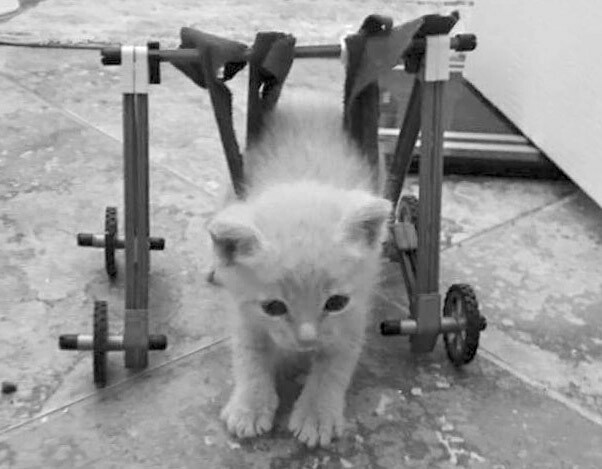 Cinder was born without fully functioning hind legs, so Dr. Kristen Hale, veterinarian, built a wheelchair for her to use.